Two teen heartthrobs, Dylan O’Brien of MTV’s “Teen Wolf” and former “21 Jump Street” star Johnny Depp, both claimed victory in their battle at the box office this weekend. O’Brien and the young adult sci-fi sequel “Maze Runner: The Scorch Trials” delivered with a $30.3 million opening for Fox. Despite taking the top spot, the film’s three-day total was a little under analysts’ projections. Depp looked every bit of 25 years removed from his “Jump Street” days in the bald wig he donned to play mobster James “Whitey” Bulger” in “Black Mass.” His sterling performance drove the $23.3 million second-place debut of the Warner Bros. crime drama and ended the actor’s run of five straight box-office fails. The weekend’s other wide opener, the Kate Mara-David Oyelowo thriller “Captive,” was dead on arrival and took in less than $2 million for Paramount. But the mountain-climbing saga “Everest” finished fifth domestically and set a September record with $9 million globally in an unusual early run on IMAX for Universal, and Lionsgate’s Emily Blunt-Josh Brolin drug saga “Sicario” posted the best limited debut of 2015, paving the way for both films’ upcoming wide rollouts. M. Night Shyamalan‘s horror tale “The Visit” got some revenge on Sony’s “The Perfect Guy,” taking in $11.3 million to edge the Sony thriller’s $9.6 million for third place. That reverses the order of last week’s debuts, when “The Perfect Guy” narrowly took the top spot over the low-budget Blumhouse Productions thriller. 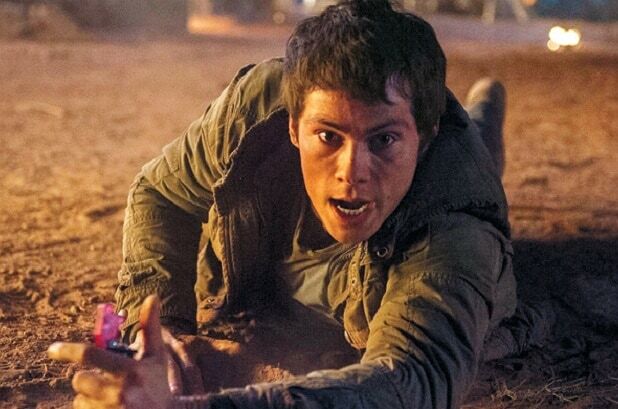 “The Scorch Trials” win was welcomed by Fox, whose last franchise film, “The Fantastic Four” flopped in August, even though it was a little under the $32 million opening of the original film on this same date last year. With this weekend’s $42 million overseas haul, the $61 million “Maze Runner” sequel is up to $108 million in 10 days of release. Kaya Scodelario, Thomas Brodie-Sangster, Aiden Gillen, Barry Pepper, Ki Hong Li and Giancarlo Esposito joined Patricia Clarkson and Lili Taylor in the film from director Wes Ball. “The Scorch Trials” received a “B+” CinemaScore from its audience, which was 53 percent female and 63 percent under the age of 25. Premium Large Format screens delivered nine percent of the grosses from the market-high 3,791 theaters. Another giant screen winner was Walden Media and Cross Creek Pictures’ “Everest,” which broke the record for a September IMAX debut by taking in $6 million from 356 locations and added another $3 million from 172 IMAX screens overseas. Those grosses are a nice benefit from the limited debut, an unusual strategic play by Universal designed to build buzz ahead of Friday’s wide debut. “He swings for the fences with his roles, and when he misses, he misses. But when he connects — as he did with this one — he hits it out of the park,” said Jeff Goldstein, Warner Bros.’ executive v.p. and distribution sales manager. Depp definitely hit it out of the park in Boston, the real-life home of the film’s main character Bulger. That city delivered a whopping 10 percent of the “Black Mass” grosses, up from around three percent it brings in on most films. The $360,000 that “Sicario” brought in for Lionsgate translated to a $65,000 per-screen average, better than any film this year and should provide a shot in arm for Friday’s wide expansion of the film, which also stars Benecio del Toro and is directed by Denis Villeneuve. Lily Tomlin‘s comedy “Grandma” took in $1.5 million from 1,044 theaters and cracked the top ten, after it added 941 theaters in an aggressive fifth-week expansion by distributor Sony Pictures Classics. It beat out Paramount’s “Captive,” which came in 11th place with $1.4 million from 806 theaters. Tom Cruise‘s “Mission: Impossible – Rogue Nation,” another Paramount film, was eighth with $2.2 million in its eighth week of release. It benefited from a 2-for-1 ticket deal offered by the studio and the largest theater chains.